Shame on me! I'm sorry, everyone. Right after the media stuff happened we had a whole bunch of house projects going on, and of course I've been taking care of a baby who is now seven months old! Can you believe it? Life with her gets better and better every day. :) There's nothing negative at all to report with mommyhood, in fact it's even more amazing than I had ever dreamed. There are a lot of infertility blogs that seemed to slow down after the birth of a baby and I always wondered why. I kind of get it now. 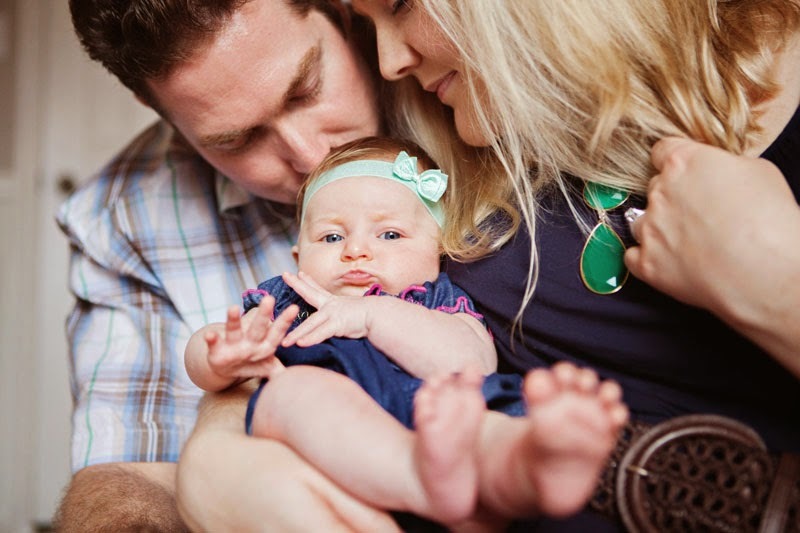 I feel like the purpose of my blog was to capture the story of our struggle to have a baby. But now that I have her, that particular struggle isn't here anymore. The appreciation surely is, but the struggle obviously is not. And a parenting blog feels like a whole different animal. Do you all really want to know how I do DIY soaps or floor cleaners? 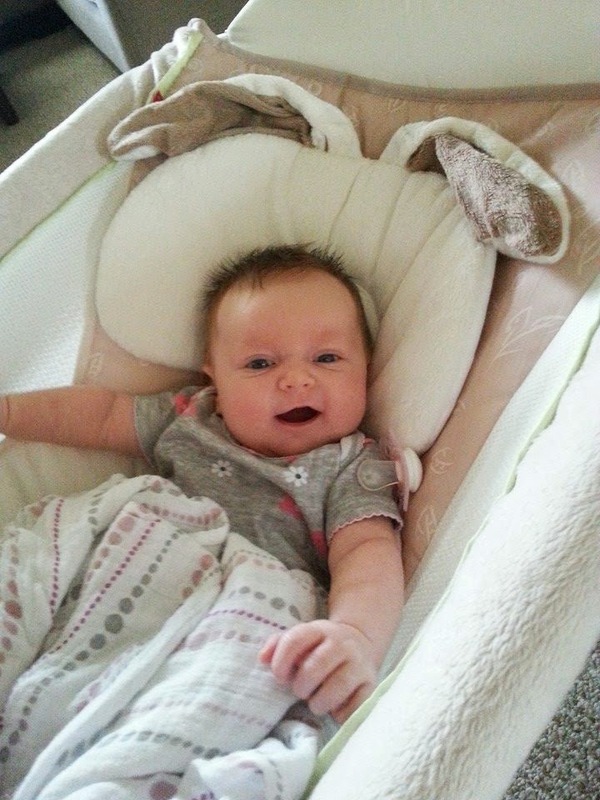 Do you really want to know what kind of diapers I prefer or the schedule in which I put her down for naps? 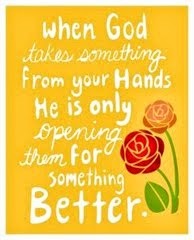 Doubtful, and that's okay. There are thousands of blogs for that, and I'm definitely no subject matter expert on any of this now. I'm just taking it a day at a time, learning as I go. I could write about all of the aspects of how embryo adoption impacts how I am a parent, but I'll be honest - it really doesn't impact it very much at all. We feel like a regular family 99.9999% of the time. Albeit a regular family who is still in awe at this miracle we've been given and don't take a moment of it for granted. In fact, last night during Sammy's bath Kevin and I said to each other "do you think we'd appreciate these moments this much had we not struggled?" and we both emphatically agreed that we likely would not have. Bath time is like winning the lottery. Singing bedtime songs to her as time stands still in her nursery is seriously the best thing in the whole world. So for that, I'm actually grateful for the struggle, our life is so rich with her in it. I do think I'll pick up my blogging again with a little more zest once we decide to cycle again. And since I'm still going strong with breastfeeding (yay!) and plan to wean at the one year mark. Our remaining little embryo is a rock star 5AA and I have a lot of hope for him/her. But I'd be naive to think it will certainly work. I'm scared of opening that chapter again. I realize, however, it will be different in many ways. We already have a little girl at home and that makes a big difference. I can't even think about very much right now because it's so hard mentally I go back into that place that we lived in for those difficult years. Right now we're soaking up family life with our prayed for little girl. My heart still is with all of you struggling. I will always be an advocate for you, an advocate for all of us. Anyway, not sure what the point of this is other than to tell you I'm still here, loving motherhood! A whole lotta Embryo Adoption press! Wow, talk about a whirlwind of Embryo Adoption awareness! I'm super excited about all of the buzz we've been creating. We were on Good Morning America this morning! For those of you wondering, how did People find me? The answer is: HERE. Through my blog. The writer of the People stories read my blog and saw my passion for wanting to spread awareness about embryo adoption, and she offered me a vehicle to do just that. I knew she'd handle our story with care and respect. And boy oh boy, did she deliver such a beautifully written story. It been wildly popular. Shared almost 35k times on social media! And let me also say, for those of you wondering, no agency, website, or organization is sponsoring our story. No one has paid us. I won't take a penny. There's no secret agenda behind our motivation to run with this other than to let people know it's an option to build a family. I want donors and recipients to match up who otherwise may not have known this was an option for them. There was a mention about agency grants and funding fueling this media buzz from us. That's not true. I've never worked with an agency, and I don't endorse any particular agency, website, organization, etc. I only endorse this process. I plan to remain neutral, unbiased, and support all forms of embryo adoption and donation through all of the different routes that make it possible. What is next for us? Well, I hope to go back to normal life. There are other families in our EDA community who are also planning to share their stories with the press, and I'm planning to pass the baton to them from here. I want other families to be highlighted in addition to ours. Embryo adoption is not a fad, a trend. It's a legitimate and incredible way to build a family. And it's an answered prayer for those with embryos to donate and those wishing to become parents. And above all else, I'm so thrilled that our story has brought a spotlight to Libby's pediatric cancer awareness charity, Unravelpediatriccancer.org. If you haven't already had a chance, please visit and support her incredible cause. After all, her beautiful daughter Jennifer was the catalyst for all of this to be possible for us. She is our hero. 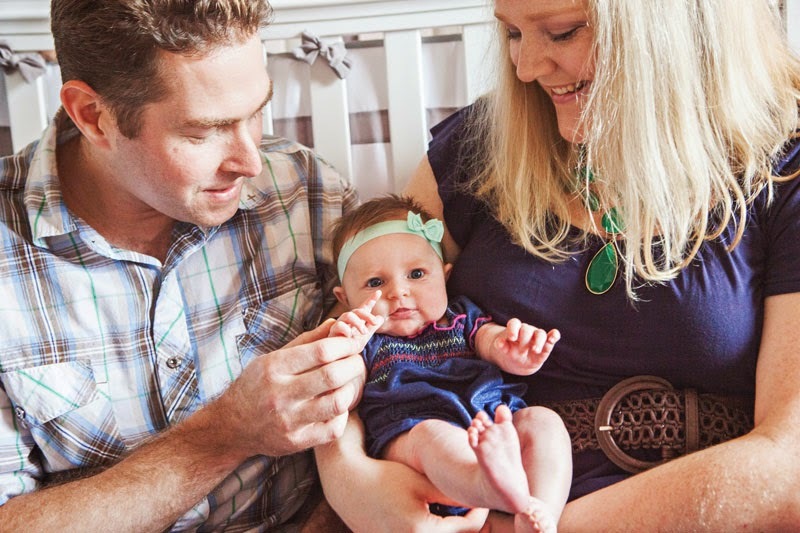 Kevin and I have been interviewed by People.com about our journey to parenthood using EA. I'm so thrilled to be able to share our story on such a public stage. I hope this brings awareness to EA and inspires others to donate their remaining embryos to others who would love to have a family. 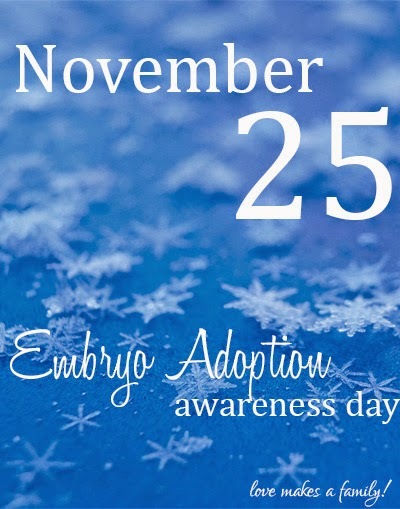 November 25 is Embryo Adoption Awareness Day! I'd like for us to establish November 25 as EMBRYO ADOPTION AWARENESS DAY! November is already known as National Adoption Month, so what better time to recognize EDA and spread awareness than during November? Also, with it falling near Thanksgiving, it gives us the ability to discuss the gratitude that EA brings to many families (and I know I'm beyond grateful to Sammy's genetic family!) How can you help? Tell your story. Share a graphic on your Facebook timeline encouraging questions. Blog about it. Contact your local media and see if they want to do a story on it with your help. If your RE doesn't do EDA, talk to them about it. If you have ideas on how to spread awareness, please leave your ideas in the comment. Thank you all for your support! What happens when your baby looks like someone else? As you can see, my blogging has slowed way, way down. That's because the boss of my new job, Sammy, is very demanding. She runs a tight ship. But I love it. And I love her. I am so unbelievably happy to be at home raising her, waking up with her, getting covered in spit up, and being screamed at. It's all worth it 110%. Being a mother is a billion times more amazing than I had even imagined. And trust me, I had high hopes of what it would be like! I had a realization I wanted to write about today in case anyone is thinking about embryo adoption and may be facing some of the same fears I did in the beginning. I'm not promising you'll feel the same way I do once you hopefully find success, but I just feel compelled to write a little bit about how those fears ended up turning out in my reality. When we first starting dipping our toes into exploring embryo adoption, I was overwhelmed with excitement and anticipation. We were faced with the decision of using anonymously donated embryos, or by doing it openly and knowing our children's genetic family. We felt strongly that having an open adoption with was right for our family. But of course, naturally all of that came with some fears too. I feared that I might someday look at my baby and not see my eyes, my nose, or my husbands ears, and I would feel sad. I worried that I might feel like I was sharing my baby with another family. Or I would feel that he/she was not really ours and we had only borrowed her from someone else. If you're reading this and it sounds like things you've secretly wondered or are currently wondering, you're not alone. These worries were much relieved once our situation with our two donor families became real. We knew how amazing they were before and during pregnancy and were proud to have them in our lives. But still I sometimes wondered about those initial fears would feel once I had a baby in my arms. 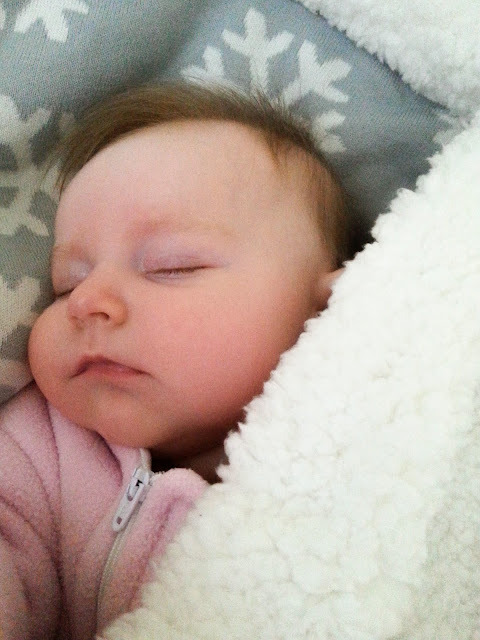 How might I actually feel when I looked at my baby and she looked like someone else? Yesterday, I had a moment that helped answer that for me. Sammy smiled and she looked exactly like her genetic mother. Her eyes and lips lit up and came together in a way that was an uncanny resemblance of Libby. Libby is beautiful, and so is Sammy. But there was no sadness. There was no jealousy. Instead, I looked into what looked so much like Libby's face and was filled with gratitude for the genetic family who made this possible for us. I was reminded of the incredible journey that brought us to this special little girl. Children do not belong to anyone. And they are all borrowed, in a way. They are their own special spirits that are entrusted to us from God for our short time on earth. And God placed Sammy in our lives with a purpose. He has taught me to always feel thankful in this little girl's smile and remember the selfless act of her genetic mother that not only gave Sammy the opportunity for life, but also finally made us a family. It reminds me of how beautiful Sammy truly is, and not just in her looks alone. I adore that she looks like her genetic family because it's a forever reminder of all of the love that went into bringing her here and how much we love those who had a part in it. And you know what's weird? She looks a lot like us too. It's like she's the perfect blend of all of us. I'm now a stay at home mom! After our crazy battle with infertility and loss, it feels surreal to write that. We weren't having any luck finding a nanny for Sammy. So I think it may have been God's way of nudging us to make the decision for me to stay home with her. Yesterday, I took Sammy into the office to meet my coworkers and while I was there, I met with my boss and gave him my resignation. I've worked in IT in the financial sector pretty much my entire adult life and accomplished quite a bit. But I'm so excited for this new job title and responsibility. Financially, it is going to mean lots of changes. But that's totally okay. I am so grateful to Kevin who is a hardworking and loving father so we can have this incredible opportunity. Sammy is already two months old! Where has time gone? I freaking love being a mom. And not just any mom, but SAMMY'S mom. She is just incredible. I never knew I could love someone like this. I can say without a doubt that all of the heartache and pain to get to this point made the moments now that much sweeter. Who knows if I would have appreciated motherhood this much if it hadn't been so hard to achieve? Even the moments where she's screaming bloody murder in my ear are appreciated and my heart is so full. I wouldn't trade any of our journey to get here because if any of it were different, these moments may not be exactly what they are right now. Breastfeeding is still going well....well, well-ish. I think there will always be ups and downs, as with anything else in life. She has reflux which has made for a lot of spit up and struggling while trying to nurse. So she's gaining weight not as quickly as I'd like. I'm seeing some reflux improvement in the past few days so I'm hoping her weight gain will pick up a little bit, but otherwise everything is great. I've already stored about 20oz of milk in the freezer. Sometimes I'll open the freezer door just to look at it. It's been a hard road and I'm weird but like seeing the stash as one of the many tangible payoffs to the effort put into it. We have a new pediatrician that we will be meeting with for the first time today and I'm strangely excited. Maybe it's because it's an excuse to get out of the house. Or maybe it's because I have so many questions I'm eager for her to answer. Maybe it's because shes not only a pedi, but also a certified lactation consultant. Or maybe it's because she's just up the street from us. Fingers crossed she works out because it almost seems too good to be true on paper! Anyway, we're going to the pedi today at 2pm and she will be getting her first big round of two month vaccines. I'm a little nervous watching her get poked like that but I know it's for the best. There's a tiny bit of mommy anxiety going on over here, I can't wait until it's over so I can snuggle her and comfort her and make it all better. Overall, things are going great. We're are following into a fairly successful routine. And ironically enough, going through the VLCAD feeding schedule her first month of life kind of set us up for that anyway. So I've found the silver lining in that hellish ordeal. She slept almost seven hours straight the other night! 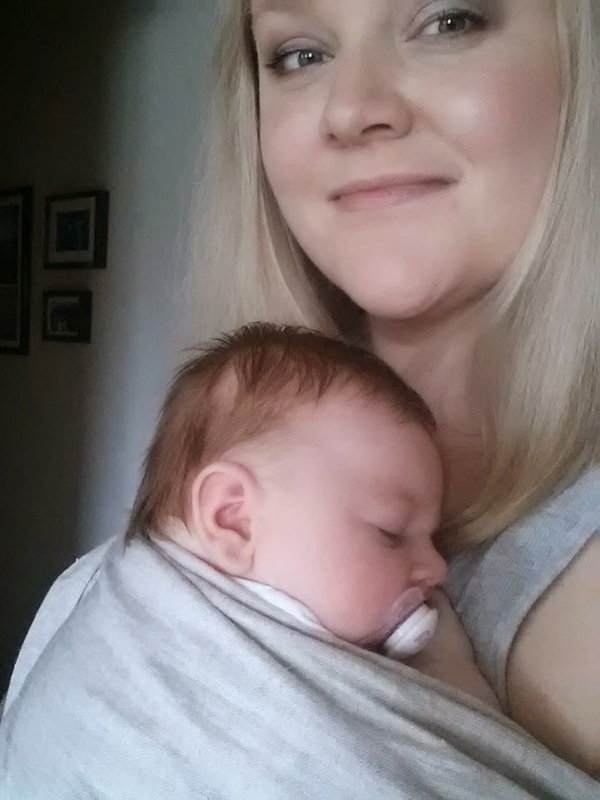 One thing that surprises me is that I've really gotten into babywearing. Aside from the joy it brings me to have her right on my body, it's so dang convenient to have her on me out and about while my hands are free. Also, people tend to want to touch her less while we are in public as opposed to if she were in her carrier. I have a Sakura Bloom Ring sling, a baby k-tan (which is too big and I need to figure out how to exchange it for a size smaller) and I just ordered a Lillebaby All Seasons which should come this week or next. Look how happy she is snuggled up in the ring sling. Well, that makes two of us! She's cooing, smiling, and positively responding to me and Kevin when she's approached and in a happy mood. It's so heart melting. I have also started reading to her. We sit and read newborn black and white baby books pretty much every day. Who knows how much she actually cares about it this early on? But so what? She is engaged, happy, and I feel like I'm setting the foundation for her to enjoy all of the reading that she and I will be doing together as she grows. It's been one of the things I've looked forward to most as I dreamed of being a mother. That, and making soapy mohawks on her head in the bathtub. And lucky for us, she has enough hair for me to do that already! For the past few weeks, I've been trying to get some family photos of the three of us with my own camera and remote control. Unfortunately, total fail. Each time either Sammy wasn't happy or the remote control wasn't working right. So I finally gave up and hired another photographer/friend and she took these beautiful photos that I'll share here! I have been so, so busy. I am finally settling into "normal" life as a mom with a new baby. It's incredible being a mom and now that I finally have this VLCAD thing not looming overhead, I'm able to really savor it! I still can't believe how horrifying that first month of her life was for me. It really was one of the hardest things I've been through, facing a life threatening illness of someone I loved so much and had prayed so hard for. I can barely even think about it because it hurt so much! I'm so glad she's okay and I'm happy to be busy with her even though it means my blog posts will likely suffer a little bit! What am I up to other than the obvious things related to caring for a sweet little baby? Well, I've been working recently on trying to find a nanny for when I go back to work near the end of October. I barely want to even type that because it makes it feel real and I still am sad thinking about leaving her at home. I hope we find someone we feel great about because it's really hard to trust someone with something so precious to us. I've also been busy trying to get my photography business up and running which involves filing for all of the proper licenses, paying fees, building websites, etc. I usually try to do this during Sammy naps and surprisingly have made some good headway here! I'm also dealing with some genetic issues myself. I swear, genetic testing has been so prevalent in our lives lately and it's back again, only this time for me. For those of you who know my story, my mom died of colon cancer at a young age and all of her three adult children, including myself, have had colon polyps at young ages. Doctors agree that there's likely something hereditary going on and I've been going through testing with an oncologist and genetic counselor to try to figure it out. I was tested for a single genetic disorder in 2012 that came back as negative. But this time, they did an incredibly extensive panel that will test for all kinds of uterine, breast, ovarian, and colon cancer disorders. It will be scary if/when I learn that I have a disorder that leads to a much higher risk of cancer. But at the same time, knowledge is power so hopefully I can do something to avoid it. I'll get the results on November 21 and am trying to put it out of my mind a little bit until then. Okay - happy news! Breastfeeding is going so well. Finally! It was so hard in the beginning. Both Sammy and I had a terrible case of thrush that we believe I got from the antibiotics given to me after the c-section in the hospital. Breastfeeding started out painful and got worse and worse until it was nearly unbearable. I'd cry. I eventually had to exclusively pump. I had no reference point and figured breastfeeding was that painful for everyone. Little did I know, it isn't. Once we found out what was going on, my OB, pediatrician, and I declared war on it and after a couple of weeks of multiple therapies it went away. All the while I also was worried about VLCAD and under a lot of stress which I'm sure impacted my supply too. In fact, if she had turned out to have VLCAD, I would have been told to stop breastfeeding anyway. So there were many times I considered giving up. But I didn't and I'm glad. Once all of those crazy hurdles were behind me, operation exclusive-breastfeeding was 100% underway. I've been nursing and pumping like crazy and I am excited to report that the past three days/nights that Sammy has been 100% breastfed with no more formula supplementation. And I am even getting enough to start build a stash. I could not be more happy about this achievement considering everything I had going against me! I can't help but pat myself on the back for what I feel like is a huge accomplishment. And I'm not sure if it's related or not, but she started sleeping through the night (5 hours) the first night she was exclusively breastfed and did it a second time last night. Yippee! I'm well rested! Sammy just started smiling and cooing in response to our silly antics this week and it makes my heart melt. I'll leave you with a picture of her toothless grin.